The University of Maryland, College Park (UMD) joins the University of Wisconsin-Madison (UW) in leading a new research mentor and mentee training initiative funded by the National Institute of Health’s (NIH) National Research Mentoring Network (NRMN). This mentoring network is part of a recently announced NIH grant for $31 million to support the “Enhancing the Diversity of the NIH-Funded Workforce” program, which will develop new approaches that engage researchers from racial and ethnic minority backgrounds in biomedical sciences, and prepare them to thrive in the NIH-funded workforce. The UMD School of Public Health’s Center for Health Equity will share $2.2 million awarded to UW by the NIH to establish the NRMN Mentor Training Core (MTC), one of three cores in the network. Dr. Stephen B. Thomas, professor of Health Services Administration in the UMD SPH and founding director of the Maryland Center for Health Equity (M-CHE), will serve as associate director and UW-Madison’s Dr. Christine Pfund will serve as the NRMN Mentor Training Core director. The NRMN is supported with a total of $19 million dollars over five years. The goal is to establish a national network of mentors and mentees through a consortium of research-intensive and minority-serving institutions, led by David Burgess at Boston College, and Elizabeth Ofili at Morehouse School of Medicine. The impetus for NRMN emerged from the startling findings of a study by Donna Ginther et. al, which appeared in a Science magazine article in 2011. The study on race, ethnicity and NIH awards found that black applicants remain 10 percentage points less likely than whites to be awarded NIH research funding. “While the authors of the study called for effective mentoring of underrepresented minority scientists, too few traditional mentors have received formal training in how to effectively mentor, and in particularly, in mentoring minority scholars. This is an urgent issue,” Dr. Thomas says. Drs. Thomas and Quinn are recognized as national leaders in development of innovative research career training programs culturally tailored for minority scholars including the Summer Research Career Development Institute at the University of Pittsburgh (2005-2006), and the Annual Health Equity Leadership Institute (2010- present) conducted in partnership with the UW School of Medicine and Public Health. Over 150 junior faculty and post-doctoral scholars have completed the program. The positive effects of mentoring on biomedical research training and career outcomes are well documented. “Unfortunately, when it comes to training URM scholars, too many well-intentioned senior faculty fall into the role of ‘tormentors,’ rather than effective mentors. Most senior faculty receive little if any formal training on the needs of URM scholars. Therefore, research mentors are seldom equipped to assume mentoring roles for URM scholars, leaving them especially at risk for inadequate mentoring support,” says Thomas. The National Research Mentoring Network’s approach accelerates beyond this status quo to proactively train mentors who can foster culturally competent mentoring relationships with URM scholars, enhancing their recruitment, advancement and persistence among the ranks of tenured faculty and across the biomedical workforce. In 2013, with leadership from Dr. Quinn, the Maryland Center for Health Equity and the UMD Office of the Associate Provost for Faculty Affairs offered a Master Mentor training program for tenured associate and full professors interested in mentoring URM junior faculty and post-doctoral fellows. Using the curriculum developed by the UW Institute for Clinical and Translational Research, seven UMD faculty completed the eight hour program spread over three days. “ With the NMRN award we can now take this master mentor training program to a national scale through the Mentor Training Core,” said Dr. Quinn. 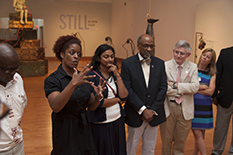 Also in 2013, UMD ADVANCE (a program funded by the National Science Foundation to increase the representation and advancement of women in academic science and engineering careers), the Office of Diversity & Inclusion, and the Office for Faculty Affairs launched Advancing Faculty Diversity (AFD), led a year-long research career development and leadership training program for UMD tenure-track faculty of color. “Our deep understanding of what URM scholars need to be successful in promotion and tenure at predominantly white research intensive universities is what makes the UMD team critical to the overall success of the NMRN Mentor Training Core,” said Dr. Thomas, lead facilitator of AFD along with Dr. Carol Espy-Wilson, Professor Department of Electrical and Computer Engineering in the UMD A. James Clark School of Engineering. Many would argue higher education institutions are “under construction” today. They need to be rebuilt to create cultures and structures that do not exclude faculty of color, women faculty, professional track, and LGBTQ faculty through every-day interactions, and policies and organizing practices inside departments. The NMRN Mentor Training Core will provide career-stage appropriate training for mentors and mentees. The approach is tailored to foster the persistence and success of a diverse group of biomedical researchers, with a specific focus on deepening the alignment and impact of these mentoring relationships. The evidence-based activities included in this core are designed to facilitate trusting mentoring relationships that support underrepresented minority scholars as they navigate their trajectory toward promotion and tenure. Established in 2010, the Maryland Center for Health equity is an NIH designated Research Center of Excellence on Race, Ethnicity and Disparities Research in the University of Maryland School of Public Health. Under the leadership of Drs. Thomas, Quinn, Butler, Fryer and Garza, the team has secured approximately $16M in NIH funded research.